Uranium exists on the moon, according to new data from aJapanese spacecraft. The findings are the first conclusive evidence for thepresence of the radioactive element in lunar dirt, the researchers said. Theyannounced the discovery recently at the 40th Lunar and Planetary Conference andat the Proceedings of the International Workshop Advances in Cosmic Ray Science. The revelation suggests that nuclearpower plants could be built on the moon, or even that Earth's satellitecould serve as a mining source for uranium needed back home. The JapaneseKaguya spacecraft, which was launched in 2007, detected uranium with a gamma-rayspectrometer. Scientists are using the instrument to create maps of the moon's surfacecomposition, showing the presence of thorium, potassium, oxygen, magnesium,silicon, calcium, titanium and iron. 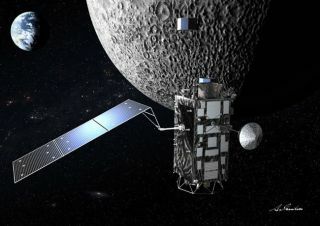 "We?ve already gotten uranium results, which have neverbeen reported before," said Robert Reedy, a senior scientist at theTucson-based Planetary Science Institute, and a member of the Kaguya scienceteam. "We?re getting more new elements and refining and confirming resultsfound on the old maps." The findings could help decide where to build future lunarcolonies, since manned outposts will need energy, and could potentially deriveit from nuclear power plants. Furthermore, since uranium supplies on Earth arescarce, mining uranium on the moon to satisfy our energy needs at homecould prove lucrative. Kaguya, officially named SELENE ("Selenological and EngineeringExplorer"), crashed intothe lunar surface at the end of its mission on June 10.